Lake effect snow is caused when a very cold winter air mass flows over the relatively warmer waters of a large lake. Intense evaporation from the lake surface under these conditions forms convective clouds that cannot contain all of this water, and some of it falls back to the surface as snow. Lake effect snow showers often organize themselves into bands or lines only a few miles across, with abrupt edges to the falling snow. The organization into lines is the result of wind shear (a change in wind speed or wind direction with height). If there is no wind shear, then the snow showers organize into individual snow shower clouds. 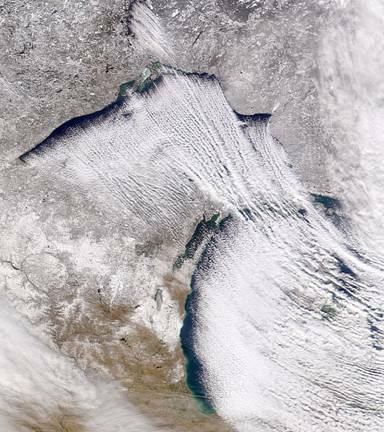 The following satellite image shows lake effect snow bands flowing off of Lake Superior and Lake Michigan. Because lake effect snow occurs downwind of lakes, one location can receive large snowfall accumulations, while another location just a few miles away receives little or no snow. Buffalo, New York is probably the most famous location for receiving large amounts of lake effect snow. The convective clouds of lake effect snow showers do not reach the heights attained by thunderstorms, with tops seldom exceeding 12,000 feet in altitude compared to 40,000 to 60,000 feet for thunderstorms. 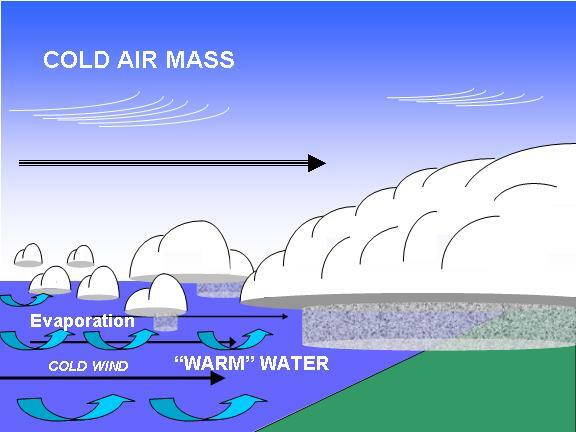 This is because cold winter air masses are quite stable, and the warm lake waters are able to destabilize the atmosphere only over a limited depth. The largest lake effect snow accumulations typically occur early in winter, before the lake waters have cooled very much. The warmer the lake water, the greater the rate of evaporation, and so the greater the supply of water vapor to the snow shower clouds. Once the lake surface cools to near 32 degrees F in the late winter, the lake effect snow mechanism weakens considerably, and if the lake surface freezes, lake effect snow activity stops altogether. BUFFALO RECORD SNOWFALL A lake effect snow band coming off of Lake Erie during December 9-10, 1995, dropped 38 in. of snow in only 24 hours, paralyzing the city.